You know when summer is over when you begin to see migrating birds passing through in your backyard, nearby park, or by the lake shore. Birders get a little bit excited about this since usually July and parts of August doesn’t have much to offer but the normal birds that you see. Now all of a sudden things are booming! First it was the abundance of hummingbirds showing up everywhere at the feeders towards the end of July and continuing probably until the middle or end of September. 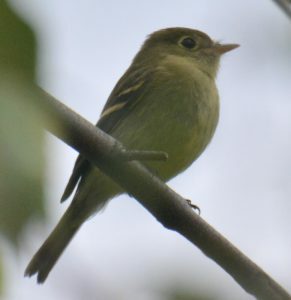 Then towards the end of August started the flurry of warblers, flycatchers (photo above), vireos, thrushes, and some sparrows coming through. 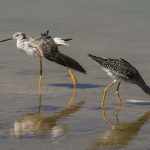 Shorebirds have been on the move over the last couple of weeks also with many sightings being reported of sandpipers, egrets, herons, and cormorants to name a few. 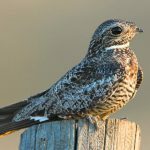 Night Hawks are being seen in the sky with flocks of up to 50 or more too. Yes, it is a very exciting, adventurous time for birding! The excitement of the birding comes when someone reports a sighting of a bird that they spotted on E-bird or on the popular birder’s Facebook page such as the Cincinnati Birders page that we use. Those reports tell us to start paying attention to the birds coming through our yard and at the Arboretum where we walk, and at the nearby lake, shoreline or mudflats. Of course, our walk now becomes more like a slow stroll to search the trees for possible migrants and our drives take a little longer now as we stop to look at the nearby lake or any mudflats, to see if there are any shore birds. Honestly, Jeff is more in to the shorebirds than I am but I do like to tag along to see them too. 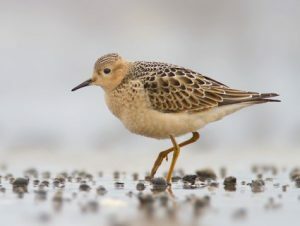 For example, last weekend someone reported a Buff-breasted Sandpiper at the mudflats by Lost Bridge over in Ohio near the Indiana border. We drove over there from our house in Northern Kentucky (about a 20 to 30 minutes drive depending on traffic) last Friday, Saturday, and Sunday to see it, as it was still being reported. Did we see it? No we did NOT! and that can be a little frustrating when someone just reported seeing it 15 minutes before we got there. Or as on Saturday about an hour after we were there. But, it is all about LUCK when you are going for a bird and really that is what makes it so adventurous! How do you get in on the action? It really depends on what you want to see. 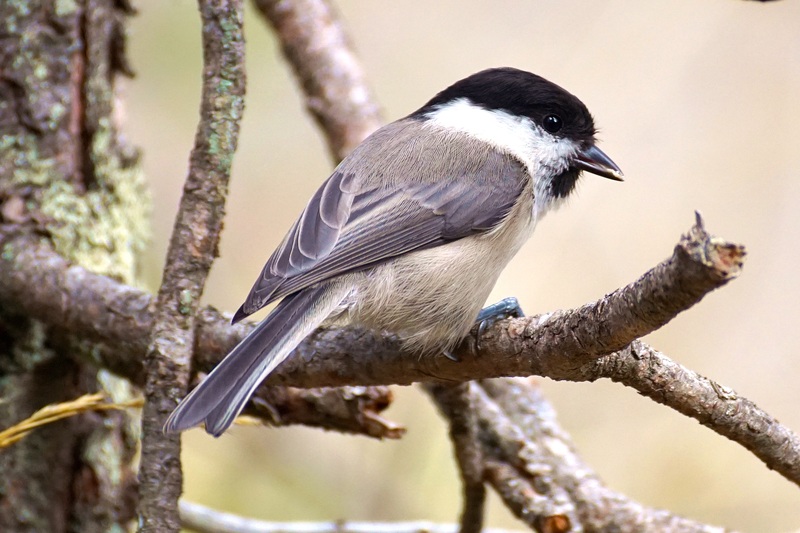 If you want to see the songbirds coming through, watch for them in your trees or even at your feeders. The warblers are easy to detect because they tend to flit around a lot on the branches in the trees looking for insects to eat, at least that is how I know to find them. The Fall migration birds are much more plentiful than when they came through in the spring too. That is because you now have offspring added to the mix of adult birds. However, identifying the birds can be a little more tricky in the Fall. Gone is the bright plumage for attracting females for breeding season. Now you have the winter plumage which is little more subdued color on most birds. Also, there isn’t any singing going on which helps to identify the type of bird that is calling. The best thing to do when you see a bird that you cannot identify is to take a photo of it so you can take a look later with your bird guide to figure it out. That is what my husband Jeff did just last Sunday with a Redstart. He knew it was Redstart but wasn’t sure if it was a male or female so he took the picture to confirm it. 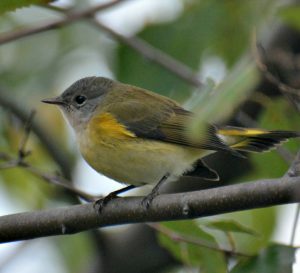 The photo was of a female juvenile Redstart. As for the shorebirds…if you drive near any mudflats or lake shores check them out to see if there are any herons, sandpipers, or gulls around. Lastly, watch the sky. Night hawks can be seen flying over brightly lit areas such as billboards, stadium lights, and streetlights searching for insects that they eat. In your backyard they will be flying over around dusk. We sit out on our deck watching for them starting around 6:30 or 7:00 until it gets dark. What to look for: They have very long, pointed wings, a slender body with a large head and notched tail, and a heavily barred underside with white bars near the tips of their wings. They have a darting flight with erratic twists and turns and changes of direction. They are pretty cool to see too! One More Clue! After a storm or if there has been unsettled weather migrants may be forced to stop in their pathway and drop down out of the sky until they can continue their journey. Birders all anticipate that hoping for more birds to show up. It’s called a Fallout. Also, birds like to fly with the winds at their backs so a strong wind from the north entices them to move and so does cold temperatures. So search for them while they last! Posted in Backyard Birds, Songbirds.